A writer, not a fighter. Words are my weapon. For the longest time, art in its visual form has only been seen in galleries, museums and enclosed spaces where people expect it to be. And that’s how it always was, up until artists began to find another medium to display their art: the streets. When street art first began, it was only seen as an act of vandalism. It has been and still is discredited by other visual artists and art critics. Heck, street artists are rarely featured in art history books at all. In this article, I am going to write about one of the most infamous street artists of all time, Shepard Fairey. Although street art is often criticized for being a form of vandalism rather than an art form, Shepard Fairey’s art as a whole has created not only a social movement in itself but also has a deeper, more contextual meaning to explore. Fairey created a social experiment with his artwork. It wasn’t about the sticker itself, because the OBEY sticker has no meaning. It’s about the various reactions people have when they view it, and how it reflects on their individual personalities. For example, someone who admires the image for what it is will observe is and not question its existence. But the more conservative or paranoid viewer, will be confused by its existence and question why it is there and see it as an underground cult with rebellious intentions. The reality is, it’s hard to know if street art should be considered an act of vandalism or not. For Fairey, it’s all about how “street art has to stand out from the static and contend with the metabolism of the city.” In order for him to create his art, he needs to use the city as his gallery. It has everything to do with the message he is trying to send with his work. Fairey’s art simply wouldn’t exist if he couldn’t put it in places where people see it every day. Art Journalist Richard Chang puts it like this: “Although graffiti and advertising may seem autonomous, they share the same bloodline. Both appeal to and react to pop culture in the same way, and the entrepreneurial genes that drive advertising can also be found in graffiti.” In order for this art to exist, it needs to show up in the world the same way advertising does. On billboards, in subway stations, on walls, etc. The whole concept behind Fairey’s work isn’t always in the visual itself, it’s the act of doing it. Thus, making the message the medium. Moving on in time, Fairey took his popularity in the world of street art and used it to send out messages regarding politics, issues of war, human rights, and ecology. Successfully establishing himself as an outspoken counter-culture figure. A piece of art in particular that brought him a lot of fame and attention was his Obama Hope poster (fig. 3). In 2008, when the election of the 44th president of the United States was on everyone’s mind, Fairey decided to create an image that unknown to him, would become a social icon and the foundation of Barack Obama’s political campaign. The poster Fairey produced used an image of Obama that was taken by a photographer from the Associated Press. In the photo, Obama is faintly gazing off into the distance, and the word “HOPE” is printed in big, bold letters underneath him. Fairey used variations of red, white, and blue pigments that are found within the American flag. Indeed painting an ideal picture of the perfect political candidate, someone Americans would want to run their country. Again, Fairey’s concept of cultural phenomenon applies. The visual Fairey painted of Obama sends a quick message to the viewer, and when it was seen over and over again on pins, hats, wall murals, posters, and t-shirts that everyone wanted to possess, the message created a promise in people’s minds. It stood for “the reinstatement of the nation’s trampled principles, the resurgence of disenfranchised ideals and beliefs suppressed since the time of the civil rights era”. 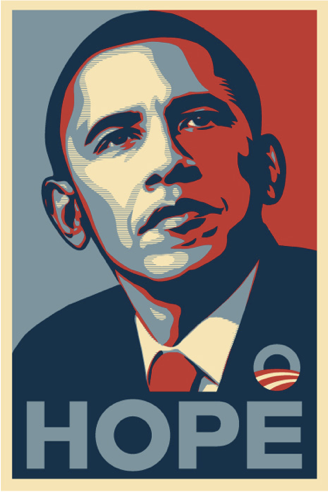 The Obama Hope poster was easily mass produced and spread across the nation. Many people are quick to judge Fairey because of this. Stating he isn’t a “true artist” and art in its true form shouldn’t be able to be mocked or recreated on a larger scale. After his poster became more popularized, the AP attempted to create a “smear campaign” against Fairey. Saying he was a criminal and a vandal who stole the copyrighted image of Obama and used it as his own. This gave people even more of a reason to judge his artwork. Questioning if any of the work he created is even his own. The thing is, artists use imagery all the time to create their artwork. The inspiration has to come from somewhere, and sometimes it’s a copyrighted photo. What people need to realize is, art isn’t always about the medium itself. It’s also about the deeper, contextual meaning behind the work. Why did he choose that photo specifically? Why did he choose to make the art when he did? All of these questions point back to the bigger concept behind Fairey’s work: the phenomenon of human interaction. It’s all about uncovering what people’s reactions are when they encounter an image, not about the image itself. Fast forward eight years down the road, Obama ran his course as president, and Fairey was publicly satisfied with the outcome. But there was a new political territory on the front, one that Fairey wasn’t so fond of. The election of the 45th President of the United States, Donald Trump. In a not-so-subtle reaction to Trump’s shocking election, Fairey created a poster titled Demagogue (fig. 4). Although compositionally similar to the Obama Hope poster, this one had a very different meaning behind it. The poster depicts a black, stenciled outline of yelling mouth with a red border. The word “DEMAGOGUE” is printed above his enraged face and below, the band title “Franz Ferdinand”. Although the entirety of his face isn’t shown in the poster, one can easily dismiss it as Trump. Fairey created this poster for the modern punk rock band “Franz Ferdinand” that often uses Russian Constructivism as a foundation of their album artwork. In a blog post about the artwork on his website, Fairey stated that he “listened to the song and considered (his) thoughts about Trump as a sociopath and a destructive force in politics and society”. This image Fairey created clearly depicts everything he wants it to say with one simple word and a vague nod to Trump himself. The juxtaposition of the Obama Hope poster and the Demagogue poster says it all, there isn’t much more to add. Fairey encourages his followers to “listen to the song, look at the art, and search (their) own conscience for where (they) stand on the politics of fear and division versus the politics of hope and inclusion”. He ultimately leaves his artwork up to the viewer to decide their point of view about what it means to them. Thus, turning it back to the observer and their reaction to the artwork itself. Although Fairey is obviously heavily involved as a counterculturalist when it comes to politics, he is also one when it comes to environmental issues. His collection of work Damaged was released in a timely manner in November of last year. Damaged is a series of mixed media portraits that portray an array of women and environmentalist issues. The artwork he produced for Damagedended up being used for the Women’s March. The images he created in this campaign deeply explore the damaged state women’s rights, politics, and the environment. For example, his work Wrong Path (fig.5) is a collage of several different subjects in response to the array of issues going on currently in America. In Wrong Path Fairey cleverly juxtaposes images of serene nature with industrial imagery of oil rigs and transit. It gives the viewer a chance to observe all of the symbolism and think about the meaning behind the piece itself. It’s clear that Fairey isn’t telling the observer what to think, but he is merely encouraging them to think about what is going on all around us. There is definitely something to admire about street art, in that it is so in the moment and can be used as a response to current events going on before our very eyes. People who care about the environment face so many challenges, especially with the shortsighted policies currently being passed in the legislature. And Fairey’s imagery successfully portrays that. So, what is it about street art that makes it so appealing, or unappealing to certain people? It has to do with two things. One, the social context and the message behind it. And two, the placement of the artwork and why it lives on the street. People don’t agree with the messages it sends, and the fact it can be considered “vandalism”, but in a way that’s the point of street art itself. We should think of street art as all and only those artworks that make the street essential to its meaning. The street can be physically apart of the work or be incorporated into the work’s true context. Although street art’s existence flourishes in a different environment than institutional art, it shouldn’t be criticized in the same way art is portrayed in a traditional setting. Street art is about the message it sends to the people who interact with it. As I mentioned before, it’s similar to advertising. Street art brings the everyday world into our perspective and fills our vision outside of where we would normally expect it to be. Street art embodies a different success than “high art” it truly allows art to join the living and evolve with the changes going on in the world around it. Shepard Fairey has successfully embodied the true meaning of street art. He uses it as a social experiment. It’s all about the observer, how they perceive the art, and what their reaction is to the art. Whether it imposes a positive or negative reaction doesn’t matter so much, the only thing that matters is that it successfully establishes a response from society. “The existence (of street art) is worthy as long as it causes people to consider the details and meanings of their surroundings. In the name of fun and observation.” An excerpt from Fairey’s manifesto, and a strongly worded statement about what his art is and how it should be perceived. The progression and popularity of Fairey’s work clearly shows that he reached his goal of phenomenology. Admiring the thought behind the work itself, and why it’s placed where it is, parallel with current events is what makes street art so intriguing. It captures the human mind in a moment of chaos and sends a message to the observer, allowing them to do the thinking. It’s about how the art reflects the psyche of the viewer, making the message the medium. Armitage, John, and Joy Garnett. “Radicalizing Refamiliarization.” Journal Of Visual Culture 8, no. 2 (August 2009): 176–183. Academic Search Premier, EBSCOhost (accessed July 7, 2018). Abrams, Amah-Rose. 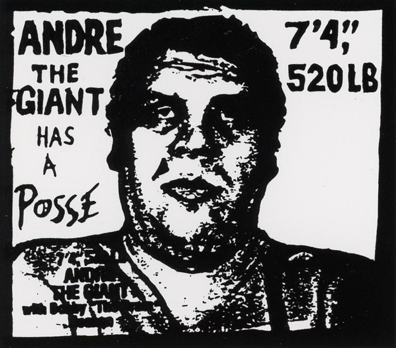 “Is Shepard Fairey a Street Artist or Fine Artist?” Artnet News. November 18, 2015. 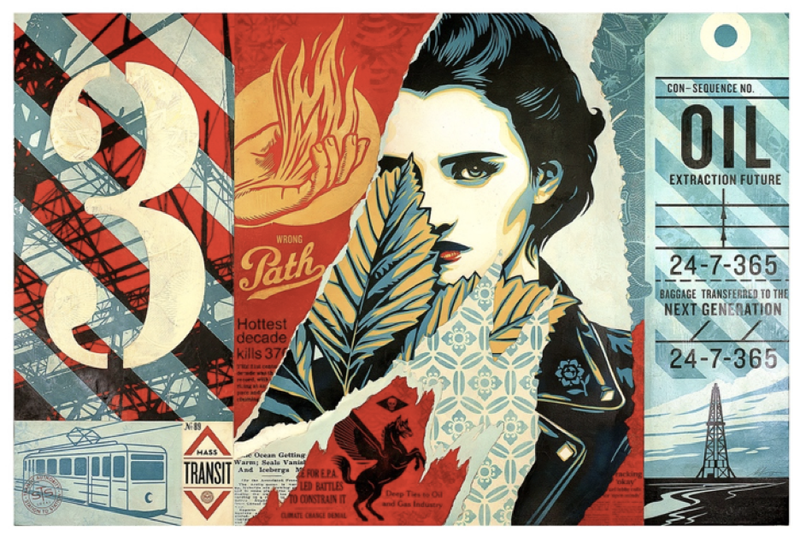 Accessed July 22, 2018. https://news.artnet.com/art-world/shepard-fairey-street-artist-fine-artist-364553. Chang, Richard Simon. “Separated at Birth.” Columbia: A Journal of Literature and Art, no. 36 (2002): 59–71. http://0-www.jstor.org.library.scad.edu/stable/41808124. Exit through the Gift Shop. Directed by Banksy. Produced by Jaimie DCruz. By Rhys Ifans. Performed by Banksy and Shepard Fairey. United States: Producers Distribution Agency, 2010. Fairey, Shepard. “Damaged Opens 11/11 in LA!” Obey Giant. August 29, 2017. Accessed July 07, 2018. https://obeygiant.com/damaged-opens-1111-la/. Fairey, Shepard. “DEMAGOGUE PRINT AVAIL. 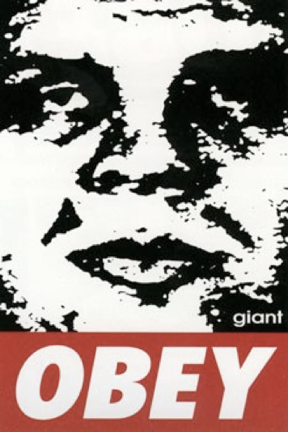 10/18.” Obey Giant. October 18, 2016. 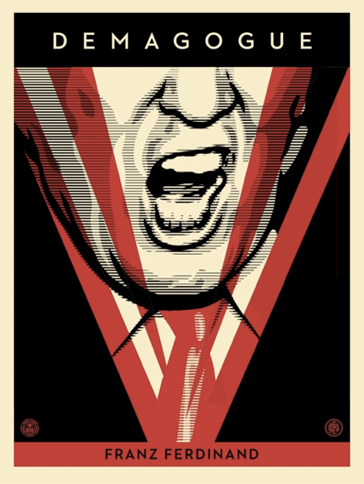 Accessed July 07, 2018. https://obeygiant.com/demagogue-print-avail-1018/. Fairey, Shepard. “Manifesto.” Obey Giant. 1990. Accessed July 07, 2018. https://obeygiant.com/propaganda/manifesto/. Lemons, Stephen. “Obey Giant Bombs the World.” Obey Giant. June 22, 2000. Accessed July 07, 2018. https://obeygiant.com/articles/obey-giant-bombs-the-world/. RIGGLE, NICHOLAS ALDEN. “Street Art: The Transfiguration of the Commonplaces.” The Journal of Aesthetics and Art Criticism68, no. 3 (2010): 243–57. http://0-www.jstor.org.library.scad.edu/stable/40793266. Salib, Peter N. “The Law of Banksy: Who Owns Street Art?” The University of Chicago Law Review 82, no. 4 (2015): 2293–328. http://0-www.jstor.org.library.scad.edu/stable/43655484. Sturken, Marita. 2009. “The New Aesthetics of Patriotism.” Journal Of Visual Culture 8, no. 2: 168–172. Art & Architecture Source, EBSCOhost (accessed July 7, 2018). Just another ad man with privilege who’d have been shot dead by now if not for the lack of melanin in his skin. Snore.